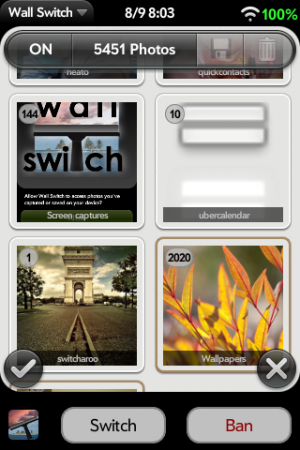 Wall Switch, available for a limited time price of 99 cents in the App Catalog, will now allow webOS 2.x users that ability to rotate their wallpaper background using their own photos from any combination of albums on their device (unlike Switcharoo that only allowed a single album). It even works if you have thousands of pictures on your device, as I tested it with over 5,000 without any slow down or issues. 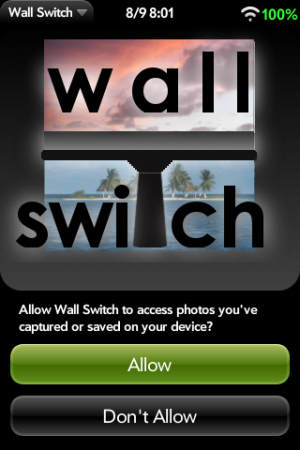 Upon loading up the app for the first time, you will be presented with an option asking to "Allow Wall Switch to access photos you've captured or saved on your device?" Make sure you select "Allow" or else the app won't work properly. Once you are in, the main screen of the app is divided into three sections: a header bar on top, thumbnail versions of your photo folders, and checkmark and X buttons on the bottom. The first thing that you need to do is to determine which photo albums you want the app to use. Tap on each album (the number of photos in the album is listed in the top-left corner of each album) and the album with get a brown highlight around it. At the same time, the cumulative number of photos from all the selected albums will appear on the top header bar. If you want to "select all" albums, you can press the checkmark button, or you can "deselect all" with the X button. Once you have all the albums you want to include, press the floppy disc "Save" icon on the top bar to lock in your selection. As you continue to make other album selections, you would need to press the "save" icon again to lock in your changes or you can press the "Trash can" icon to undo them and revert back to your last saved selection. 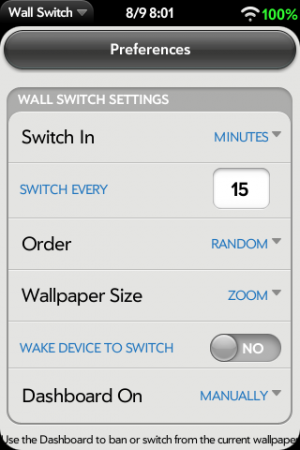 Once you are ready to activate the wallpaper switching, toggle the button on the top-left from OFF to ON and the first wallpaper switch will occur. However, before you turn it on, I would suggest swiping down from the top-left to bring down the Application dropdown menu and selecting Preferences. There are quite a few options here, allowing you to specify the time between switches and deciding if you want to use the sequential "album order" of pics or choosing "random". You can also determine with "size" of the wallpaper, either "Center" to shrink it down to fit in the center of the screen (possibly showing black bars on the top/bottom or sides if the scale is not same as the screen resolution), "Zoom" to remove that extra space on the top/bottom or sides but may result in your photo being cropped, or "Stretch" to stretch the photo in either direction to fit the entire screen. You can also determine if you want to wake the device when the background switches or allow it to stay sleeping if it's time to switch, and finally you have the option of determining if the app's dashboard should always be shown, only shown in card mode, or if it should only be activated manually. Wait, this app has a dashboard? Why's that? Well, there may be times that you want to manually initiate a wallpaper switch or you may decide that there is a photo you never want to ever see again. The dashboard for Wall Switch gives you these options by giving you a "Switch" and "Ban" option, along with an app icon that will launch the full app. As you ban photos, a red number will now appear on the top-right of an album's thumbnail indicating how many photos in that album have been banned. While you can't see what specific photos have been banned or undo an individual ban, you can press-and-hold on that album in the app to get a "Clear Banned Photos" option (although future functionality is planned to allow to you select/ban individual photos from within an album, similar to how Slide RSS works). You can also use the Application dropdown on the top-left to "Clear All Banned Photos" from all albums, or select the manual "Show Dashboard" in that Application dropdown, as well. Once you set the app to run, you no longer need to keep it running. It runs just fine in the background and will continue to switch your wallpapers. If for some reason the app has stopped working, just open it up, turn it "OFF" and then back "ON". This app is extremely easy to setup and use, and is just what any former user of Switcharoo Free would want for their webOS 2.x device. In addition, Appsotutely is close to completing an update to Wall Switch to make this app webOS 3.x compatible, so TouchPad owners who purchase this on their phone will be able to manually download the app on their TouchPad for free. And since the webOS 3.0.2 update allows third-party app access to Synergy photos, your photos from Facebook and other synergy accounts can also be included with the switch. 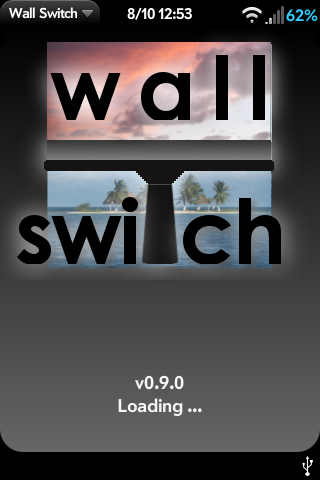 As a companion app to Wall Switch, you may also want to check out Pane Free (for free) or Multi Pane (for 99 centrs), also by Appsotutely. 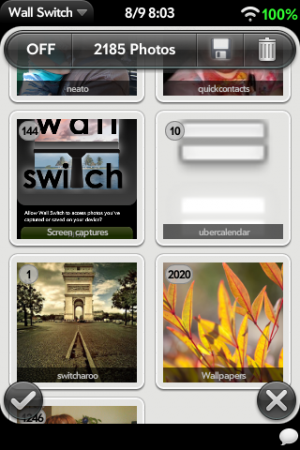 These apps will launch a card that will simply show your current background, and will change along with the updates from Wall Switch. This way to can still show off your latest background without having to push your open cards off to the side or using the lock screen to see the background.